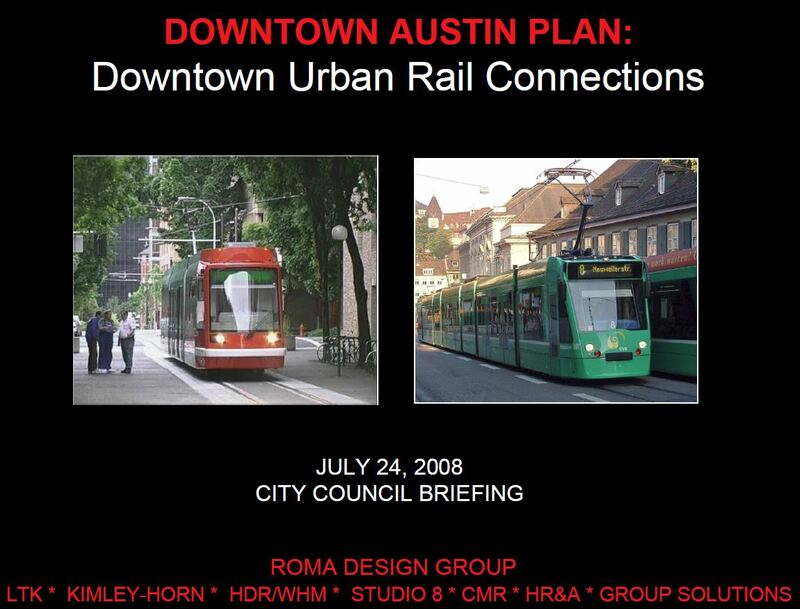 Back in 2008, City of Austin hired Roma Design Group as lead consultant to design urban rail starter system plan and promote benefits of light rail over bus services. PPT title page screenshot: L. Henry. 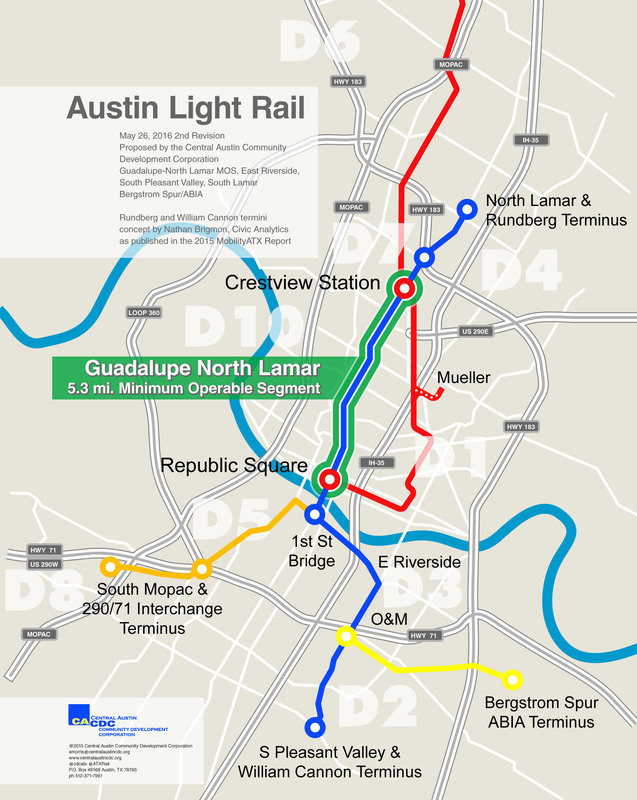 Are Project Connect, the City of Austin (COA), and Capital Metro all starting to get cold feet over advancing an urban rail project? The first suggestion of this came a few months back, as Project Connect’s Urban Rail Project (with Kyle Keahey designated the Urban Rail Lead) morphed into a so-called “High-Capacity Transit” project. 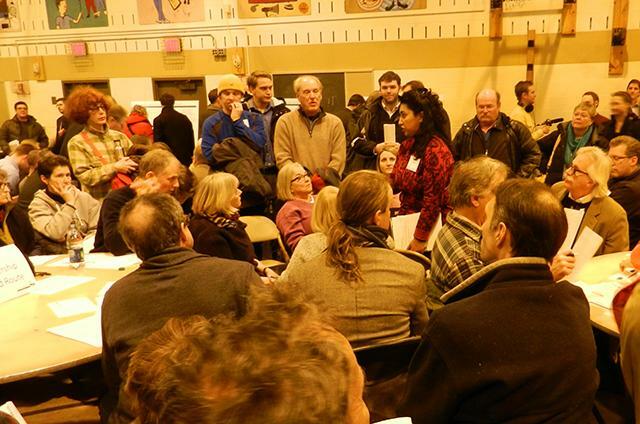 Then, more recently, there have been more frequent and persistent hints and hedging statements by local officials and transit planners referring to vague “high-capacity transit” … plus a sudden, more emphatic shift into extolling the bountiful benefits of so-called “bus rapid transit” (“BRT”). And now there are all these sudden cautions from various City and Project Connect personnel that maybe, possibly, urban rail may be off the table for much of the “East Riverside to Highland” route now in official favor. Particularly significant is the intensified emphasis with which Project Connect’s Urban Rail Lead (should he now be re-designated “High-Capacity Transit Lead”?) 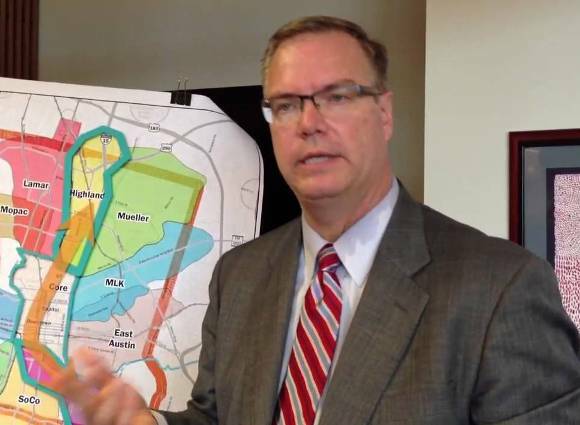 Kyle Keahey — and Mayor Lee Leffingwell — have been suddenly brandishing “BRT” (as applied to the rather mundane MetroRapid upgraded-bus service) as an exciting “high-capacity transit” possibility for East Riverside and even the so-called “Highland” route. Along with this, there’s been repeated lecturing to Central Austin neighborhoods along the West Campus-Guadalupe-Lamar corridor as to how fortunate they are to have the MetroRapid service. And of this all in the context of recent revelations that Urban Rail Lead Keahey has, on record, apparently favored “BRT” over rail transit for at least several years. See: Kyle Keahey, Urban Rail Lead, hypes “BRT” as “more affordable…more flexible investment” than rail. This sudden switch, from the promotion of rail over the past eight years, to disparaging rail and exalting bus transit, stands in stark contrast to arguments repeatedly presented in City-sponsored presentations for most of the past decade. This case for rail per previous policy is exemplified in a 24 July 2008 Austin City council briefing under the Downtown Austin Plan (DAP) delivered by a consultant team under contract to the City, led by ROMA Design Group in a consortium also including LTK Engineering, Kimley-Horn, HDR/WHM, Studio 8, CMR, HR&A, and Group Solutions. The PPT presentation, titled “Why Rail, and How Can it Work in Austin?” not only explained the background of the DAP and the team’s latest findings, but also addressed the usual questions over why the team were recommending a rail transit system (envisioned as a streetcar at that point) plus how and why it would be superior to simply running bus service. 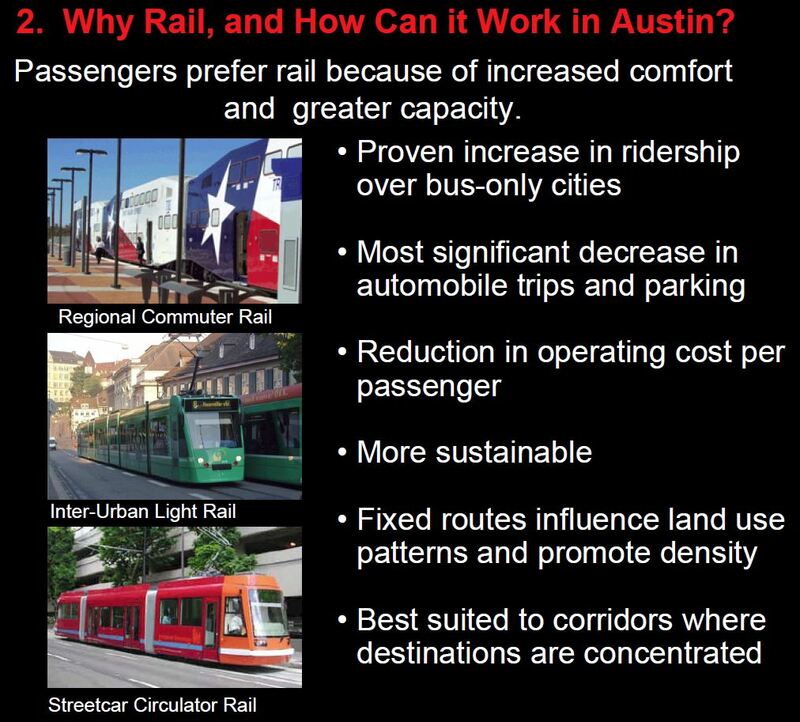 In the second major section of the presentation, “Why Rail, and How Can it Work in Austin?” this case is made in a slide headed “Passengers prefer rail because of increased comfort and greater capacity.” As you can see in the screenshot below, the ROMA team noted that rail transit has shown a “Proven increase in ridership over bus-only cities”, has influenced the “Most significant decrease in automobile trips and parking”, is associated with a “Reduction in operating cost per passenger”, and is “More sustainable”, and in addition, “Fixed routes influence land use patterns and promote density” and are “Best suited to corridors where destinations are concentrated”. Screenshot of slide from ROMA team’s Austin City Council briefing. These same arguments, disseminated by City and Project Connect representatives in many community presentations over the intervening years, are now abruptly being discarded as official planners have apparently begun to distance themselves from urban rail. Why Rail, and How Can it Work in Austin? Kyle Keahey promoting “high-capacity transit” route selected by Project Connect, Nov. 2013. Photo: YouTube screengrab. Perhaps Kyle Keahey, Project Connect’s designated Urban Rail Lead, might better qualify as “Urban Bus Lead”? Title page of Kyle Keahey’s 2010 HNTB paper on BRT (PDF version). These arguments are very similar, even in wording, to the attacks on rail transit — especially light rail transit (LRT) — from major rail opponents such as Randal O’Toole and Wendell Cox. See: Rail Public Transport Opponents. 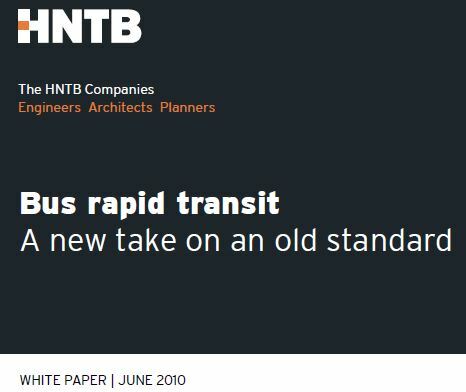 It should also be noted that Keahey’s BRT “white papers” aren’t just informational, they’re promotional — hyping the supposed superiority of upgraded bus services over rail transit. In effect, cosmetically enhanced ordinary limited-stop bus service (which might more accurately be called “bus upgraded transit”) is conceptually re-branded as “bus rapid transit”. This verbal legerdemain allows the practitioner to portray visions of relatively rapid buses on exclusive paveways and rapid-transit-style stations while simultaneously touting the much lower costs and faster implementation times of moderately upgraded limited-stop buses, running in mixed general traffic, with cheap bus stops conventionally located at curbside. See: Why MetroRapid bus service is NOT “bus rapid transit”. 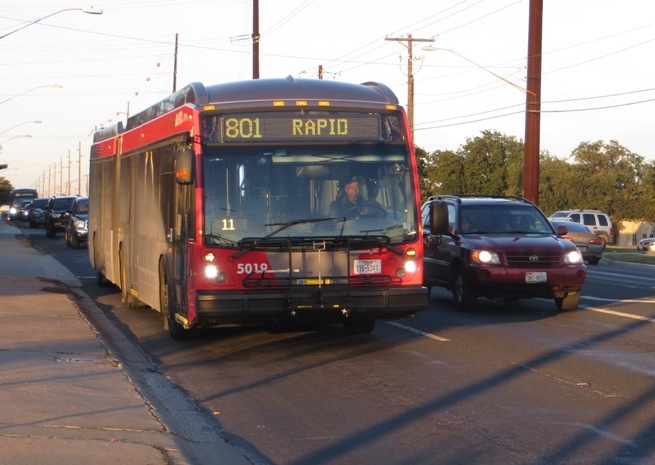 Capital Metro MetroRapid bus in test operation on North Lamar, Dec. 2013. Photo: L. Henry. In addition to being faster to implement and more affordable, BRT is a more flexible investment. Without having to place rails in the streets or develop infrastructure for overhead power, routes can be moved when traffic or economic development patterns change. Finally, BRT does not require large capital improvements beyond stations and signage versus the significant capital investment of a fixed-rail system. Snippet from Kyle Keahey’s 2010 HNTB paper promoting BRT over rail transit (webpage version). Snippet from Kyle Keahey’s 2014 HNTB paper promoting BRT over rail transit (webpage version). These kinds of claims and arguments, long disseminated by rail adversaries claiming “BRT” is “just like rail, but cheaper”, have consistently been exposed as exercises that are dubious at best and generally fraudulent, playing fast and loose with facts. • Actual rapid-transit-style BRT typically has capital costs that equal or exceed those of LRT, and tend to be significantly higher when annualized, with lower bus system lifecycle costs factored in. • Bus operating & maintenance (O&M) costs tend to be higher than those of rail transit. Thus, cities that operate both rail and bus transit have on average lower total costs per passenger-mile than cities operating only buses. • LRT systems have demonstrated significantly greater success than BRT and “bus upgraded transit” systems in attracting and retaining ridership. • Electric LRT is not dependent on increasingly expensive petroleum fuels, and produces fewer carbon emissions per passenger-mile than buses. • LRT continues to have significantly greater influence in attracting transit-oriented development than bus-based alternatives. • LRT excels in supporting urban livability and a pedestrian-friendly, bike-friendly urban environment. 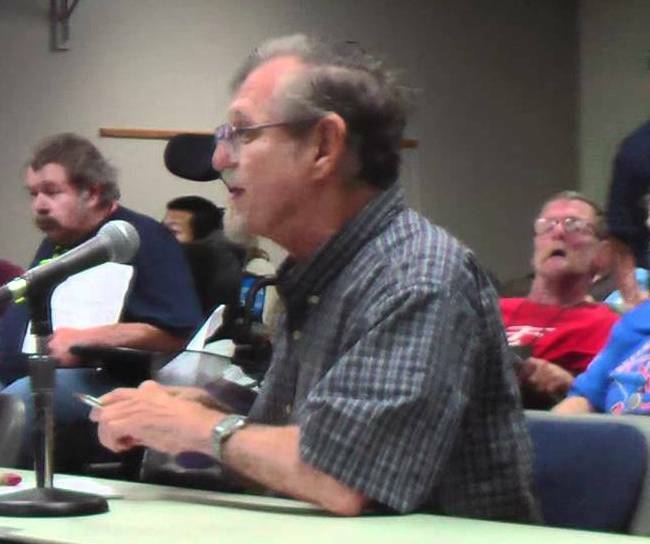 • Why has an individual who clearly believes that upgraded bus services are a better alternative to rail transit been selected as Urban Rail Lead and placed in charge of Austin’s major urban rail study? • Did this disdain for rail, and preference for bus operations, play any role in leading Project Connect’s rail study away from a fair, impartial, and technically accurate evaluation of Guadalupe-Lamar, the city’s overall highest-performing and best travel corridor? West Campus neighborhood, primarily represented by University Area Partners. Map: The Galileo, rev. by ARN. 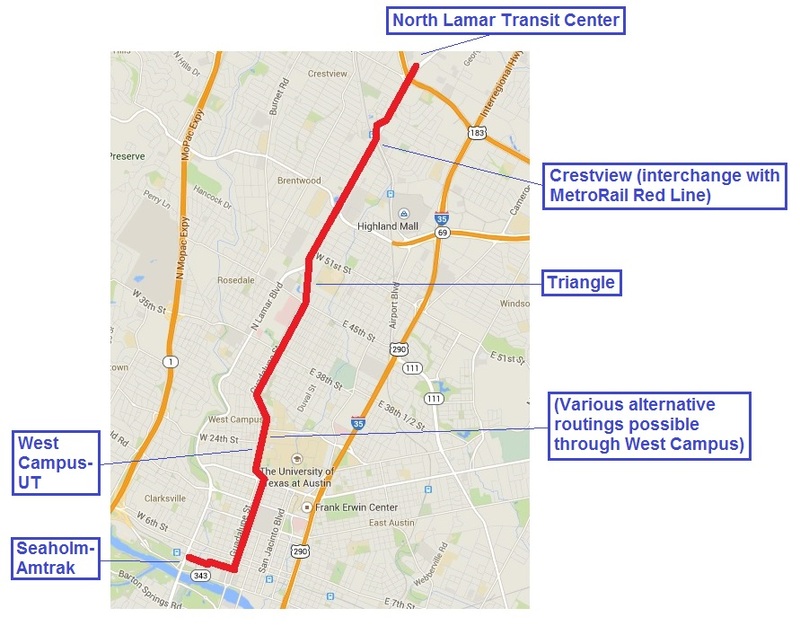 Back in November, in the midst of all the uproar over problems with Project Connect’s “Central Corridor” study and forthcoming route “recommendation”, this blog missed reporting that yet another major neighborhood association had jumped on board the effort to designate the Guadalupe-Lamar (G-L) corridor as the preferred starter-line route for urban rail (light rail transit). The University Area Partners is a neighborhood organization representing business, institutions, and property owners in the University of Texas area, encompassing most of West Campus, UT-Austin, and The Drag area. 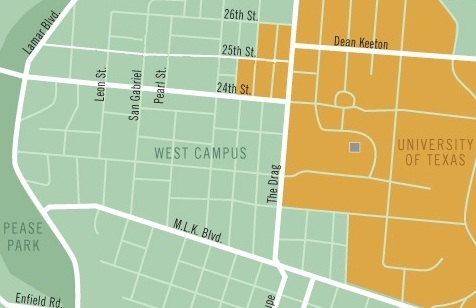 The endorsement of this influential neighborhood organization is especially important because, in terms of residential density, the West Campus ranks as the third or fourth-highest neighborhood among major Texas cities. 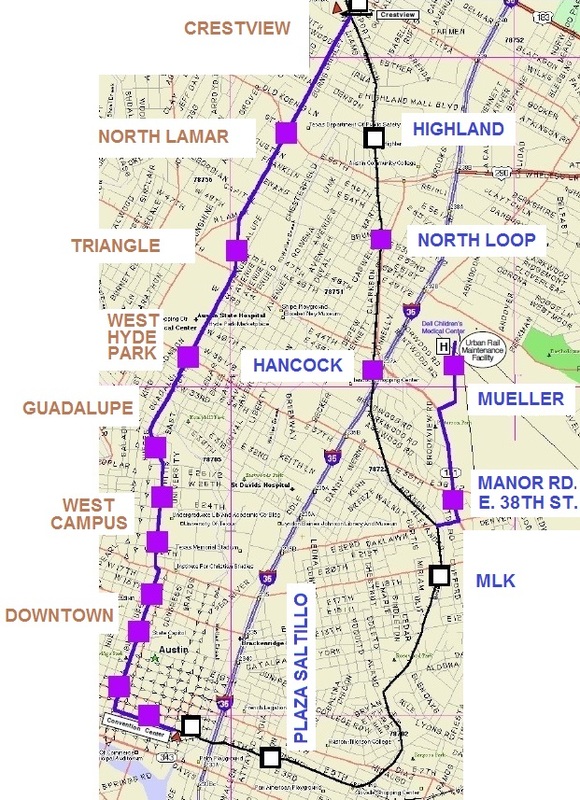 Yet, while Project Connect’s recent “Central Corridor” study used the metrics of Guadalupe and the West Campus area in its justification and analysis, its proposed “sub-corridor” configuration would effectively bypass this crucial area, instead planning an alignment on San Jacinto, one-half to three-quarters of a mile east of the Drag and West Campus neighborhood. You are currently browsing the _______________Austin Rail Now blog archives for January, 2014.